Day 7 of 7 Days of Christmas! Wow! Last 7 days were so exciting and fun-filled. Making 7 Christmas Special Recipes every single day and posting them here. Although with full-day of office at times it did become challenging. But, my motivation to bring this special series to you all was very very high. I hope you all enjoyed the recipes. Most of them are very easy to make once you have all the ingredients. I hope to bake more in the times to come and include more interesting baking recipes too. It has been such a pleasure. Line 2 round baking trays with baking/parchment paper and set aside. For frosting, In a large bowl, add the dark chocolate chips. Keep aside. In a sauce pan take the cream and heat for 2-3 minutes (don’t boil). Now add this cream in the large bowl with dark chocolate chips. Leave for 2 minutes, then whisk well to make the mixture dark and creamy. Set aside for 1-2 hours. For the cake, In the large bowl of your electric/hand mixer, add the butter and sugar and blend well. Now add the eggs and vanilla essence and blend until well combined (1-2 minutes). Mix flour, cocoa powder, salt, baking powder and baking soda together. Now add half of the coffee mixture. Blend well to a batter. Add the rest of the coffee mixture and blend well. Use your spatula at intervals to gather the flour/batter sticking on the sides of your bowl. Whisk until well incorporated. Preheat the oven. Drop the batter half-half in both theround baking trays. Bake at 180 degrees Celsius for 30-35 minutes. Bring the cakes out. Let them rest on the trays for 10-15 minutes. Transfer the cakes to a wire rack and let it stay for 15-20 minutes. When ready to frost, get one cake on a parchment/baking paper in a smooth surface. Put the chocolate frosting on the top. Starting from center and going towards the ends of the circle. Put the second cake on top (Level it from all sides). Frost this one too the same way as first. Then cover the sides of the cake too with the remaining frosting. Add some colourful sprinkles like I have done or serve just as it is. 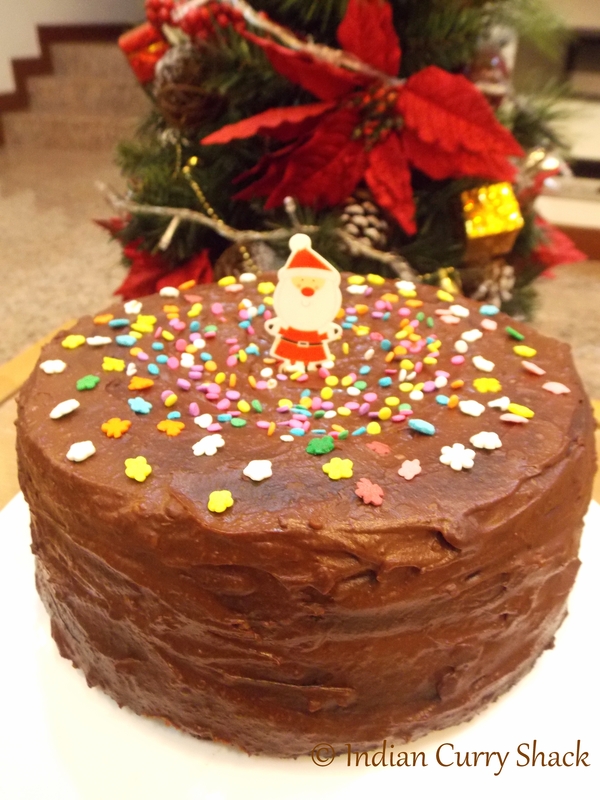 Delicious, yummy, mouthwatering chocolate cake is ready to attack on. Gorgeous, I can never get enough chocolate in my diet :).